March 26, 1926: Frances (Judy) appeared at the Second annual Spring Style Show, held at the Itasca Dry Goods Store, Grand Rapids, Minnesota. According to the review in “The Independent” newspaper, possibly written by her father, Frank Gumm, Frances emerged from a large hatbox and danced the Charleston. March 26, 1930: Frances won first prize in two events that were tied in with jean Rutledge’s eleventh birthday in Lancaster: a Recitation Program, and Easter Egg Hunt. Frances’s prize in the latter was for finding the most Easter Eggs. 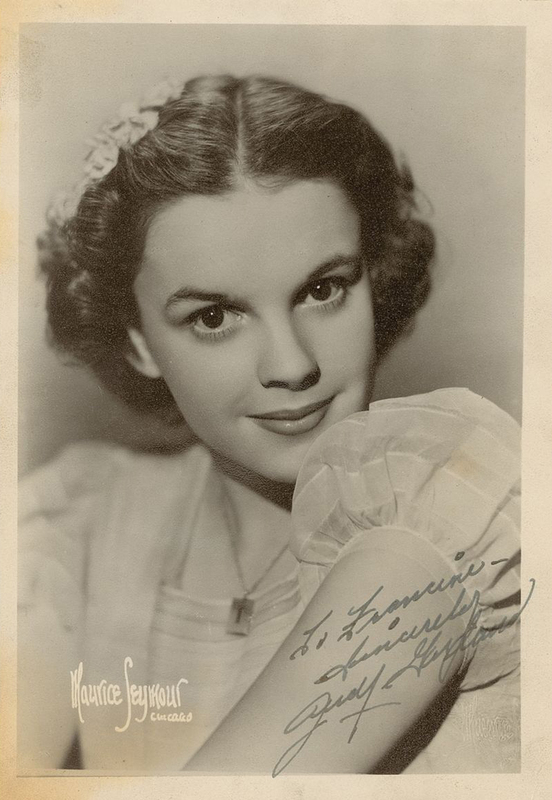 March 26, 1938: Judy was back in Chicago, Illinois, having completed her Everybody Sing tour. 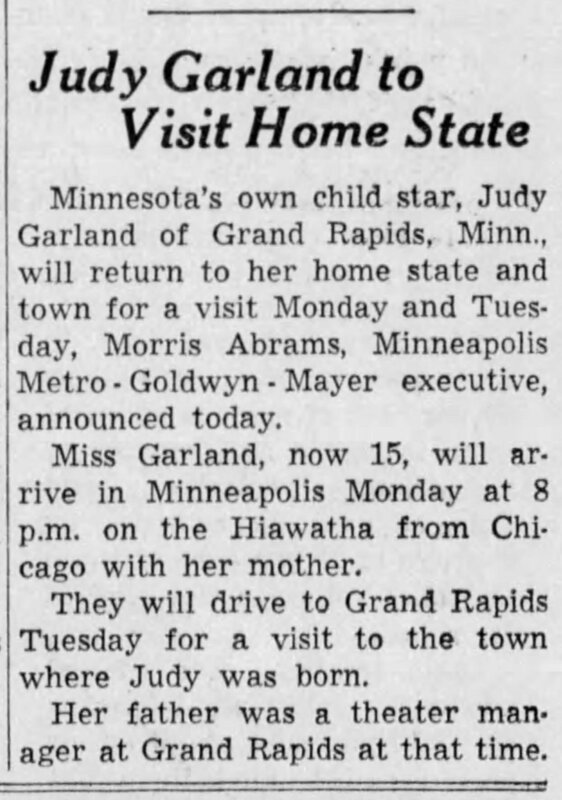 A few days later, on the 30th, she and her mom, Ethel, returned to Minnesota and Judy’s birthplace in Grand Rapids, Minnesota. On this day, Judy posed for portraits by famed Chicago photographer, Maurice Seymour (see above). 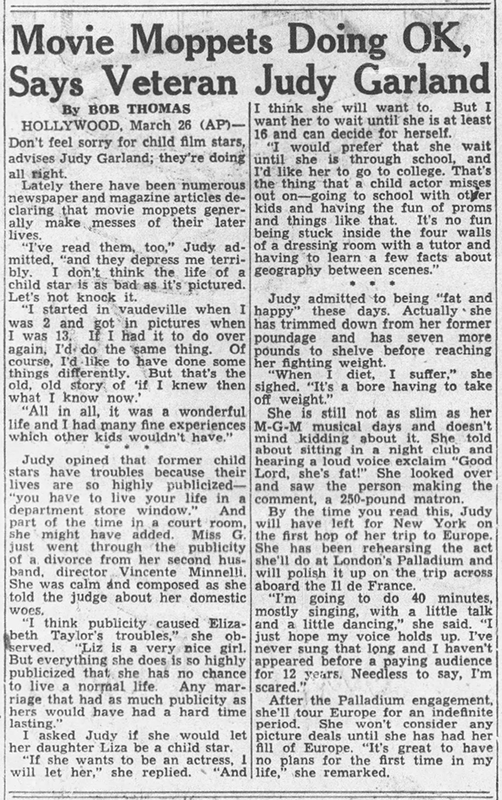 March 26, 1938: Judy is mentioned in this article about “Movie Brats” and Ethel Meglin of the famous Meglin Kiddies act of which Judy and her sisters, and a lot of other child actors/stars, were associated with, in Los Angeles. 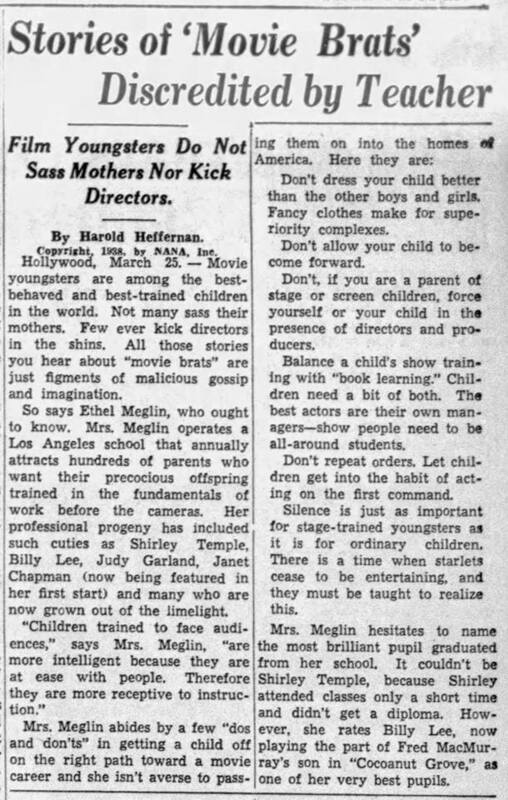 Mrs. Meglin provided some “dos and don’ts” for this wanting their kids to find stardom in the movies. Hollywood, March 25 – Movie youngsters are among the best-behaved and best-trained children in the world. Not many sass their mothers. Few ever kick directors in the shins. All those stories you hear about “movie brats” are just figments of malicious gossip and imagination. So says Ethel Meglin, who ought to know. Mrs. Meglin operates a Los Angeles school that annually attracts hundreds of parents who want their precocious offspring trained in the fundamentals of work before the cameras. 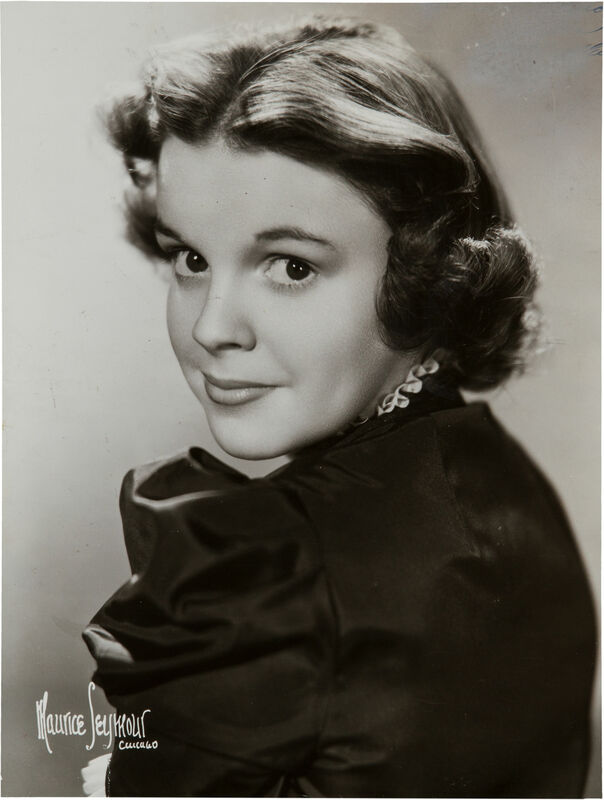 Her professional progeny has included such cuties as Shirley Temple, Billy Lee, Judy Garland, Janet Chapman (now being featured in her first start) and many who are now grown out of the limelight. Don’t dress your child better than the other boys and girls. Fancy clothes make for superiority complexes. Don’t allow your child to become forward. Don’t, if you are a parent of stage or screen children, force yourself or your child in the presence of directors and producers. Balance a child’s show training with “book learning.” Children need a bit of both. The best actors are their own managers – show people need to be all-around students. Don’t repeat orders. Let children get into the habit of acting on the first command. Silence is just as important for stage-trained youngsters as it is for ordinary children. There is a time when starlets cease to be entertaining, and they must be taught to realize this. Photo of Judy with Ethel Meglin and other previous Meglin students. 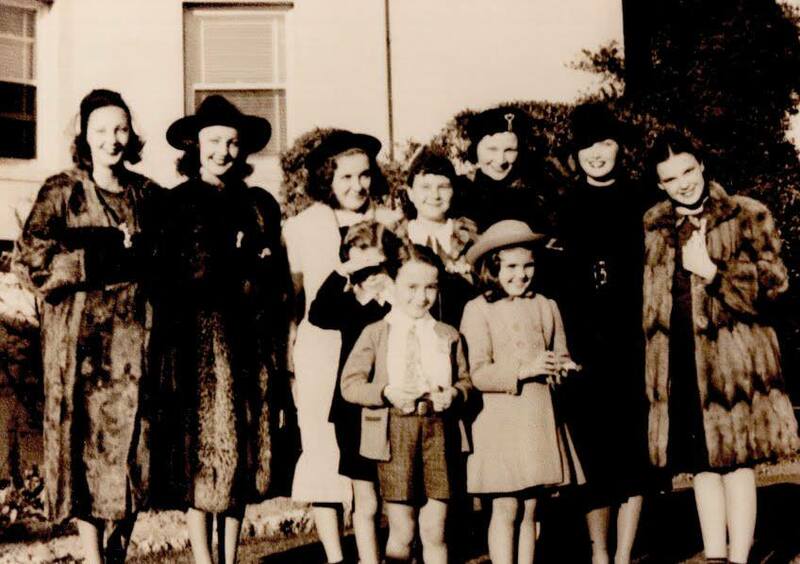 This photo was allegedly taken during a reunion of “Meglin Kiddies” in Los Angeles in mid-January 1938 outside the Ambassador Hotel’s Colonial Room (where the event took place) however there are no newspaper records of the event for that month or in all of 1938 or 1937. Pictured Left to Right – Back Row: Lorraine Grey, Virginia Grey, Maureen O’Connor, Jane Withers, Ethel Meglin, June Lang, Judy Garland. Front Row: Scotty Beckett, Billy Lee, Unknown Child. The photo was taken by Bob Stewart who was a dance instructor who worked for the Meglin school. 1938 Meglin School newspaper ad, listing Judy as one of their star pupils. 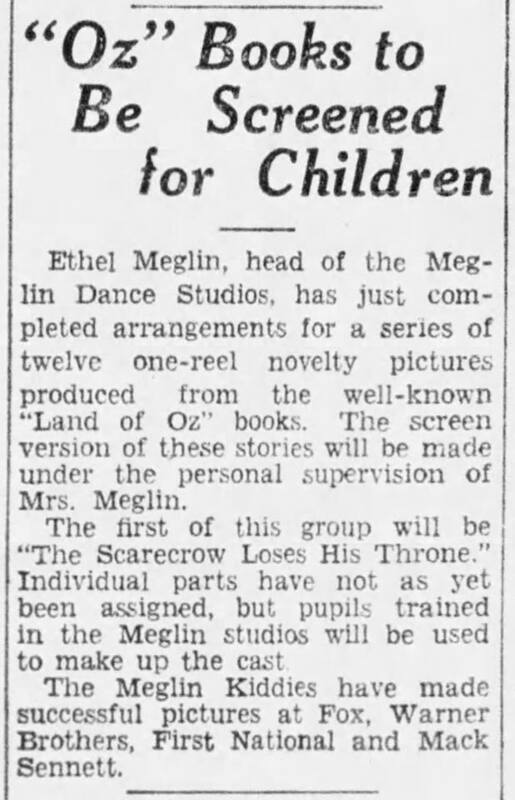 1931 notice that the Meglin Studios would produce a series of Oz films. They made one short, The Land of Oz, released in 1932. June 1988: 30 years after this article Ethel Meglin passed away. She was 98-years-old. 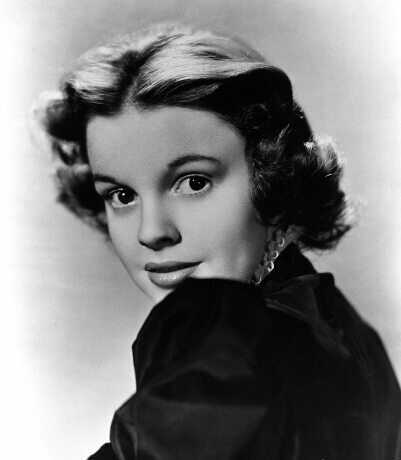 March 26, 1940: Judy’s weekly appearance on “The Pepsodent Show Starring Bob Hope” on NBC Radio. No information about the program is known to exist. 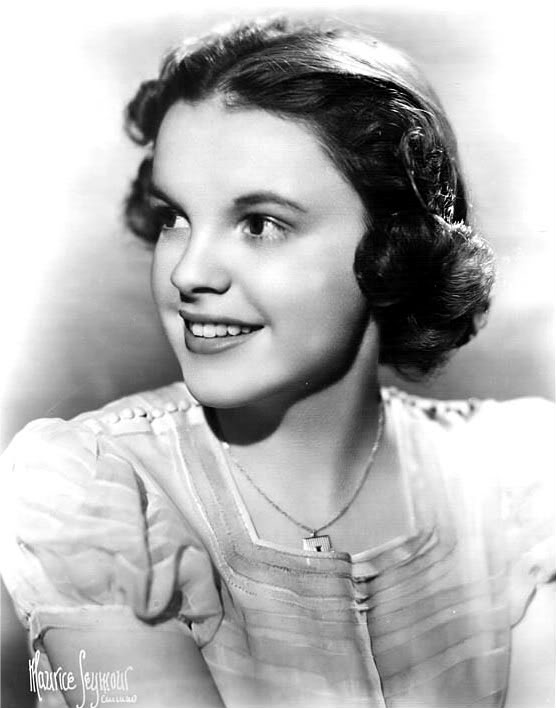 March 26, 1942: More dance rehearsals for Judy for For Me And My Gal. time called: 1:00 p.m.; dismissed: 5:00 p.m.
March 26, 1943: Filming continued on Girl Crazy on the “Interior Governor’s Office” and “Interior Ballroom” sets. Time called: 10:00 a.m.; dismissed: 4:30 p.m.
March 25, 1945: Here’s a short article about Judy’s unusual engagement ring given to her by Vincente Minnelli, and the accompanying wedding ring. Also on this date, Judy had more filming on The Harvey Girls specifically on the “Interior Harvey House” set. Time called: 10:00 a.m.; Judy arrived at 10:33 a.m.; dismissed: 5:50 p.m.
March 25, 1946: Here’s another Max Factor ad. March 26, 1950: Judy on the cover of “Comenica Della Donna” magazine. Also on this day, Judy and Sid Luft few from Los Angeles to New York, where they stayed for a few days and then boarded the Ile de France for Europe. 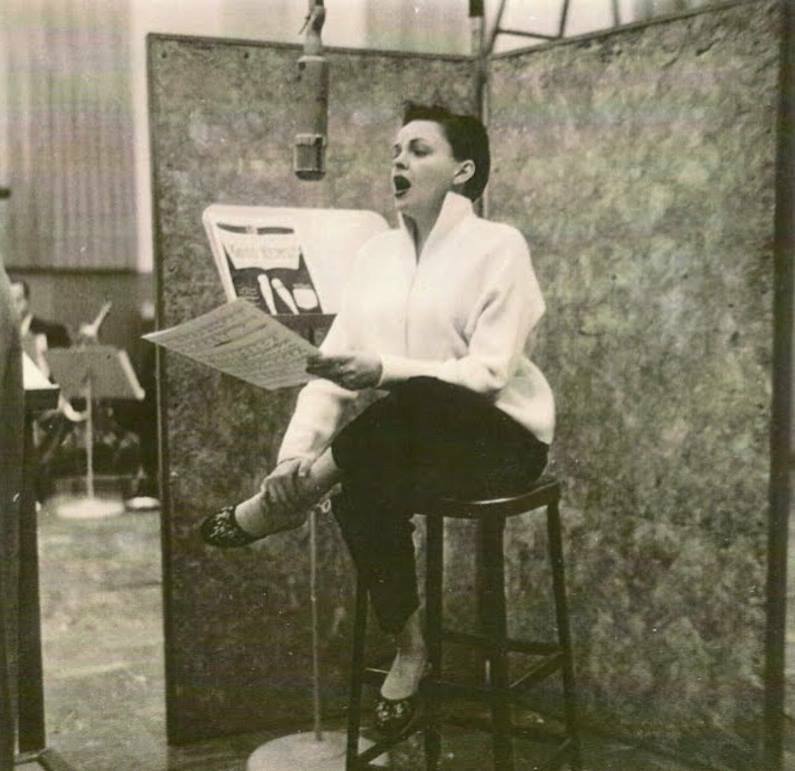 March 26, 1956: Judy’s second recording session for her Capitol album “Judy” at the Capitol Records studios in Hollywood, California. 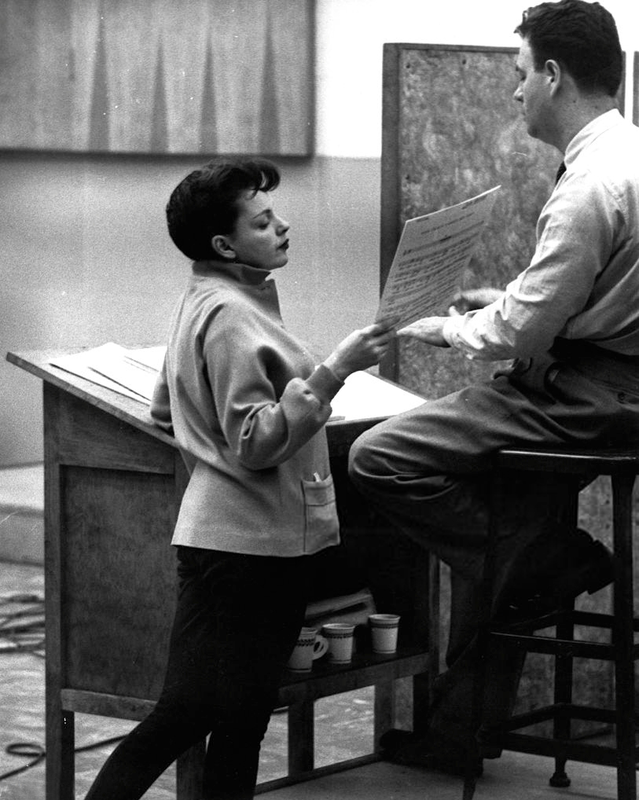 Judy, with Nelson Riddle arranging and conducting, recorded “I’m Old Fashioned”; “Memories of You” and “Just Imagine.” “I’m Old Fashioned” was dropped from the album, but added back when it was first released on CD in 1989. 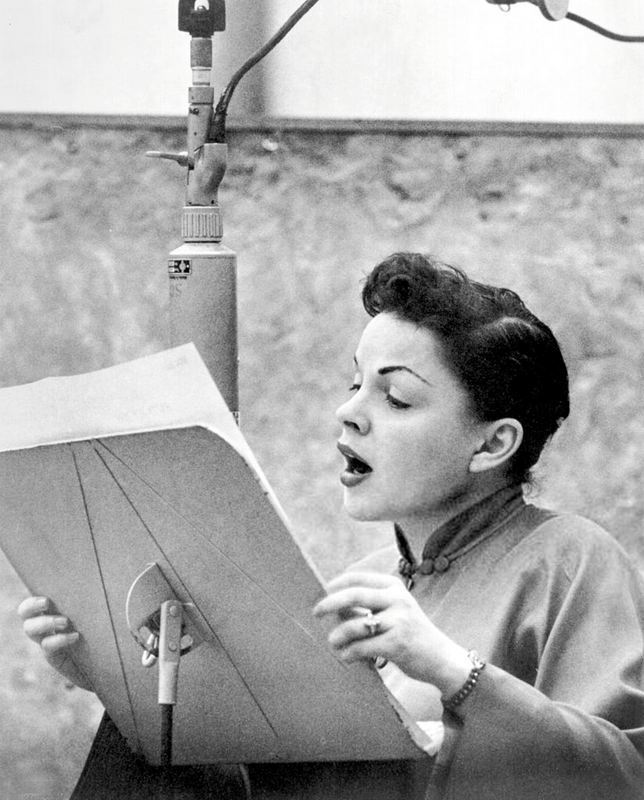 Photos: Judy in the recording studio on this day, the last photo was taken while she was recording “Just Imagine.” Note that Judy is wearing two different blouses so it’s unclear if that first photo is from a different day or if she changed? 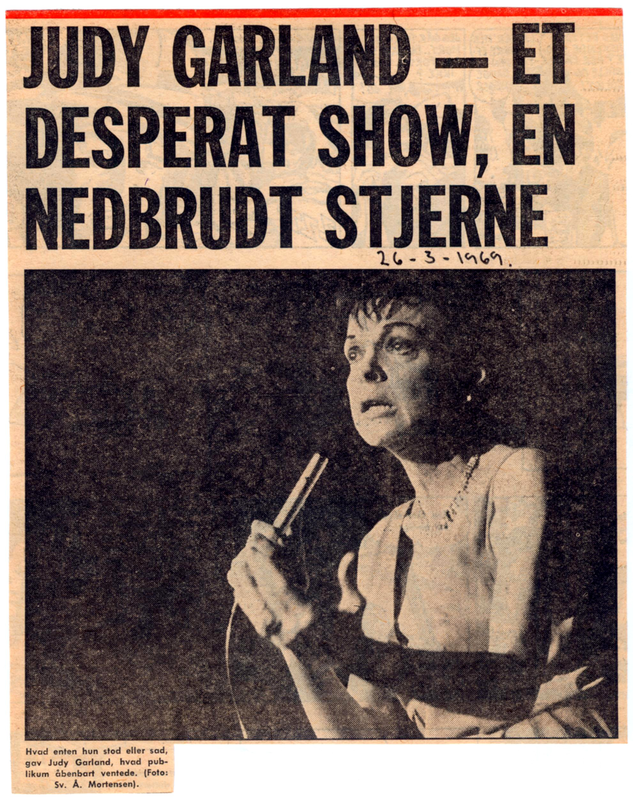 March 26, 1964: Judy returned to Stage 43 at the CBS Television City studios in Hollywood to tape the twelve-minute production number of “Born In A Trunk” from A Star Is Born, plus another song, to air as the last song on the final episode. 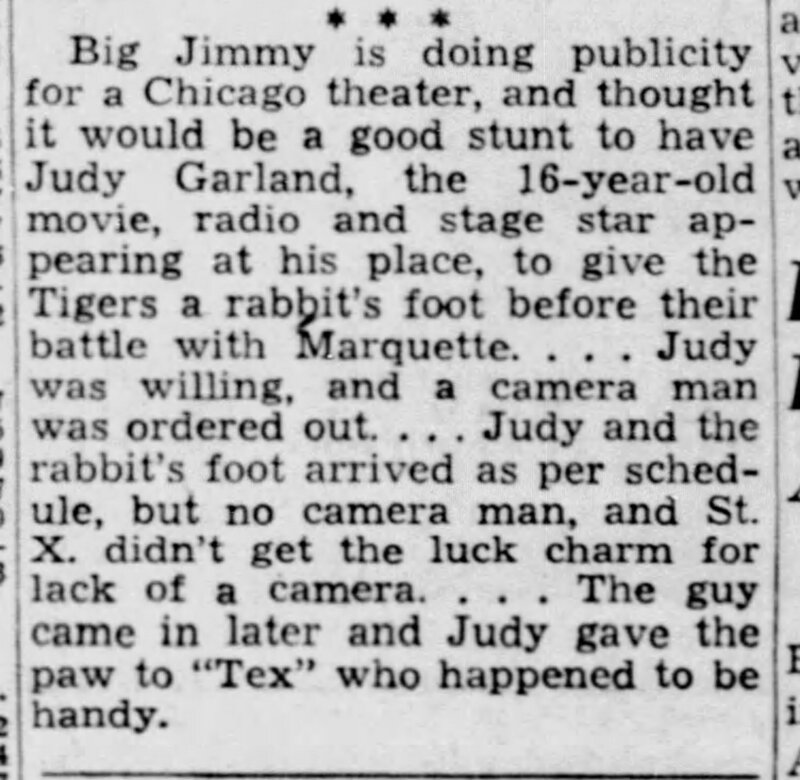 Judy arrived at 5:20 p.m. (forty minutes early); a rehearsal with the band went from 8:00 – 9:00 p.m.; the taping was scheduled from 9:30 to 10:30 p.m. Unfortunately, the twelve minutes of surviving videotape show Judy trying to get through the routine with only the first few minutes usable. The final airing of the show, on Sunday, March 29, 1964, would use the thirty minutes/nine songs from March 13; five songs from “Episode Twenty-Two,” taped February 14 (with Jack Jones); and one song – “By Myself” – that was deleted from “Episode Twenty-Five” due to time constraints; to fill out the hour. The series was a big hit with critics and audiences in spite of its low ratings (having to go against the juggernaut of “Bonanza” – a stupid decision on the Network’s part) and was nominated for four Emmy’s: Outstanding Variety Program (“The Danny Kaye” show won); Judy and her guest Barbra Streisand both nominated, separately, for “Outstanding Performance in a Variety or Music Program or Series” (both losing to Danny Kaye); and “Best Art Direction & Scenic Design” (lost to “Hallmark Hall of Fame”). Thankfully, the series and most of the outtakes survive and are available on DVD and YouTube for everyone to enjoy. 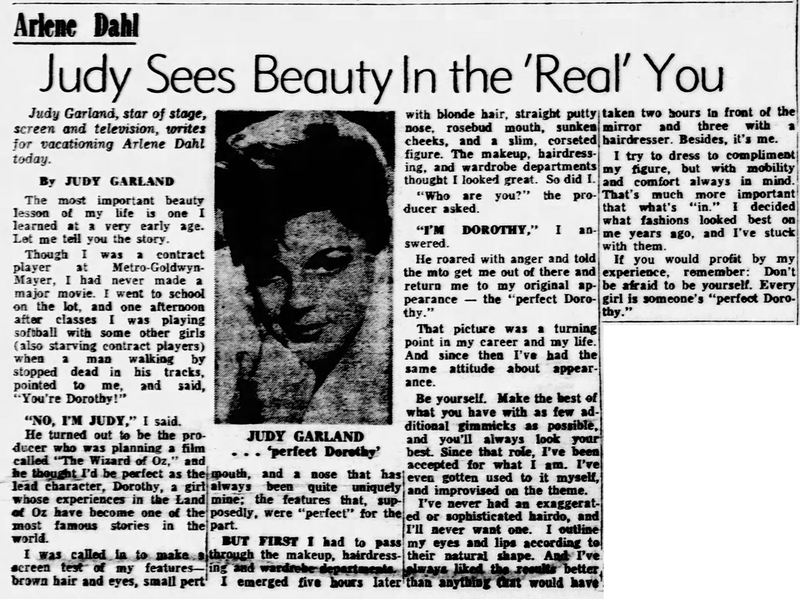 March 26, 1968: Judy was one of several celebrities who filling in for a vacationing Arlene Dahl by writing an installment of her beauty column for her. Judy sure spun a tall tale in this one! 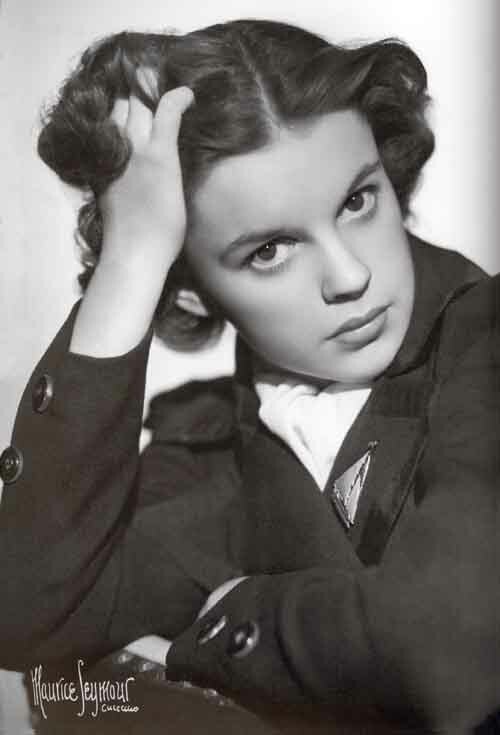 Judy Garland, star of stage, screen and television, writes for vacationing Arlene Dahl today. The most important beauty lesson of my life is one I learned at a very early age. let me tell you the story. “NO, I’M JUDY,” I said. He turned out to be the producer who was planning a film called “The Wizard of Oz,” and he thought I’d be perfect as the lead character, Dorothy, a girl whose experiences in the Land of Oz have become one of the most famous stories in the world. I was called in to make a screen test of my features – brown hair and eyes, small pert mouth, and a nose that has always been quite uniquely mine, the feature that, supposedly, were “perfect” for the part. BUT FIRST I had to pass through the makeup, hairdressing and wardrobe department. I emerged five hours later with blonde hair, straight putty nose, rosebud mouth, sunken cheeks, and a slim, corseted figure. The makeup, hairdressing, and wardrobe departments thought I looked great. So did I. “Who are you?” the producer asked. That picture was a turning point in my career and my life. And since then I’ve had the same attitude about appearance. Be yourself. Make the best of what you have with as few additional gimmicks as possible, and you’ll always look your best. Since that role, I’ve been accepted for what I am. I’ve even gotten used to it myself, and improvised on the theme. I’ve never had an exaggerated or sophisticated hairdo, and I’ll never want one. I outline my eyes and lips according to their natural shape. And I’ve always like the results better than anything that could have taken two hours in front of the mirror and three with a hairdresser. Besides, it’s me. I try to dress to compliment my figure, but with mobility and comfort always in mind. That’s much more important than what’s “in.” I decided what fashions looked best on me years ago, and I’ve stuck with them. 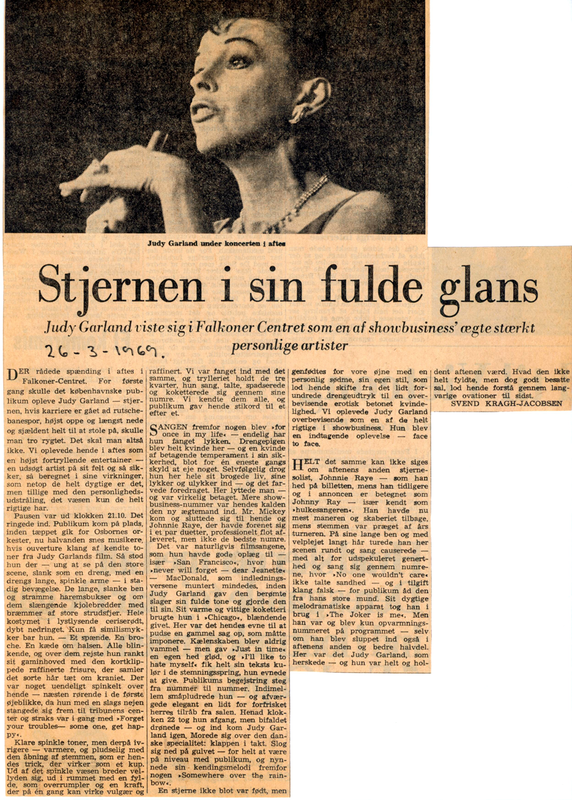 Images above: A March 26, 1969, article about Judy and her show as printed in the Danish “Berlingske Tidende Review” and the last one, with the caricature, as printed in the Danish “Politiken Review.” Scans provided by Kim Lundgreen. Thanks, Kim!